An acoustical analysis of the grunts, barks, wahoos, copulation calls, and yaks from baboons shows that, like people who use several vowels during speech, these nonhuman primates make five distinct vowel-like sounds, according to a study published January 11, 2017 in the open-access journal PLOS ONE by Louis-Jean Boë, Grenoble Alpes University, France, and colleagues. A prevalent idea on the origin of speech is that the low human larynx is required to be able to produce sets of distinct vowels, and that the high larynx of nonhuman primates prevents them from producing the vowels found across human languages. Thus, scientists believe that language originated relatively recently, within the last 70,000 -100,000 years, and little research on links between the vocalization of nonhuman primates and human speech has been undertaken. 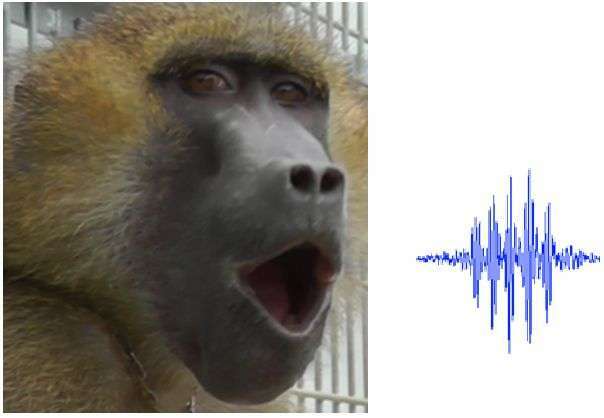 To investigate any such parallels, Boë and colleagues analyzed 1335 spontaneous vocalizations produced by 15 male and female Guinea baboons in different social contexts, and studied the anatomy of vocal tracts from two baboons that died of natural causes. The researchers found that baboons produce five sounds that have important similarities with the vowels of human speech. People form each vowel sound with a precise control of tongue position in the vocal tract, and the anatomical analysis revealed that baboon tongues have the same muscles as human tongues. This suggests that these monkeys likewise use tongue movements to form each of the vowel-like sounds. Taken together, these findings suggest that spoken language in people may have evolved from articulatory capacities that were already possessed by our last common ancestor with baboons, or about 25 million years ago. I wonder what baboons think about human vocalizations. Wish they could write, they likely would write something very much like the article above about our vocalizations.